Last Week the Expedition Visited Rapid City, South Dakota. The Ocean Doctor’s “50 Years – 50 States – 50 Speeches Expedition“ is a one-year journey of outreach, education, and discovery, announced by Dr. David E. Guggenheim on his 50th birthday (October 6, 2008) to bring, at no charge, speeches about the oceans to schools in all 50 U.S. states plus territories. By its culmination at the end of 2009, the “expedition” will have reached well over 100 schools and tens of thousands of students to share firsthand accounts, stories, humor, passion, and important lessons about the oceans and their conservation. Through additional outreach in the visited communities, engagement of the media, and encouraging the visited schools to connect with each other and share their perspectives on the oceans through a new online social network, it is hoped that this project can help encourage an enduring wave of renewed interest in the oceans by its next generation of explorers, scientists and stewards. The expedition is a joint project of The Ocean Foundation, the project’s fiscal sponsor, along with 1planet1ocean, and is supported by your tax-deductible donations to the “Ocean Doctor’s 50 Years – 50 States – 50 Speeches Expedition Fund” at The Ocean Foundation. Become a supporter! Support the Expedition – Buy Expedition Gear! Google Earth 5.0 – Now With Genuine Ocean!! within the new Google Earth 5.0! February 2 marked the launch of an exciting new version of Google Earth. Version 5.0 finally brings you the other 70 percent of the planet, allowing you to journey under the vast oceans of the planet. It also marked the relaunch of our “ExpeditionCasts” podcast series, and you’ll find five of these videos — including “Attacked by the Giant Squid’s Cousins” — featured in Google Earth 5.0. We are proud to have collaborated with Google and many other organizations to make this new product a reality. Hello from Havana, where I’ve been working this week to prepare for our important sequel to the landmark meeting in 2007 where representatives of the U.S. and Cuba gathered in Cancun to work to bring collaboration in marine science and conservation to a new level. I can’t go ten minutes without a discussion of the recent presidential election, and I’ve been handing out buttons from the inauguration of Barack Obama that are treasured here. “Estamos muy contento” is what I have heard many times. (We are very happy.) Most believe it will mean a welcome change in Cuba policy and most of my colleagues are optimistic, as am I. 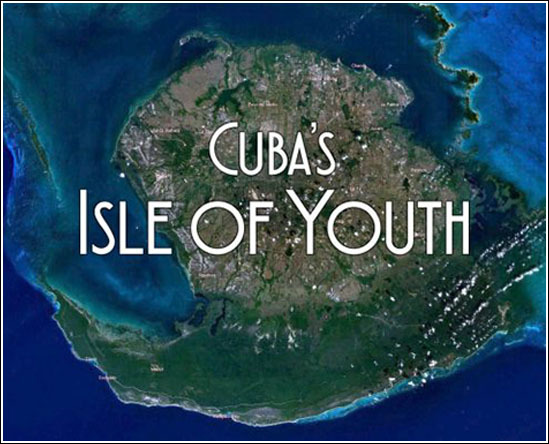 In a few minutes I depart to speak to a few Cuban school children about the oceans, an unexpected but welcome stop on my 50-50-50 expedition. My Spanish is good enough to make the presentation while bad enough to keep the kids laughing at my mistakes. It should be a fun morning. I would like to take this opportunity to ask for your help in keeping the expedition going. I’ll need your help to allow me to continue this journey. And I hope you’ll read my blog posts as I travel from state to state, and learn with me from the students, teachers and others about their perspectives about the oceans, and of course, I hope they learn from mine. The expedition is a joint project of The Ocean Foundation, the project’s fiscal sponsor, along with 1planet1ocean, and is supported by your tax-deductible donations to the “Ocean Doctor’s 50 Years – 50 States – 50 Speeches Expedition Fund” at The Ocean Foundation. Thank you for your support! Hasta pronto, mis amigos. P.S. For my personal commentary from at sea or behind my desk, I invite you to read OceanDoctor’s Blog or follow me on Twitter! Does this email look garbled? See a nicely formatted version of this and earlier newsletters here. Was this copy of ExpeditionDispatch forwarded to you? Get your own subscription by subscribing here. 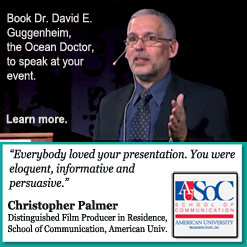 The “Ocean Doctor,” David Guggenheim, is featured in the forthcoming book, Lessons from Empowering Leaders by Ed Poole, author of Lessons from the Porch and Lessons from the Crossroads. The author brings examples of leadership to life through storytelling in his latest book. Pre-order your copy! Have OceanDoctor’s blog posts delivered to you by email. Subscribe here. The ExpeditionCasts podcast made its debut from the Bering Sea. Thanks to your positive feedback, the series resumed earlier this week with new features, interviews, and video, bringing you dispatches from expeditions, research and conservation projects around the world. You’ll find ExpeditionCasts videos within the new Google Earth 5.0. And remember, you don’t need an iPod to subscribe to a podcast, and it’s always free. Simply SMS text “subscribe oceans” to 41411 from your mobile phone. Conservation is impossible without a good cup of coffee! Get your own 1planet1ocean coffee mug and lots of other cool stuff at the 1planet1ocean shop, and help support our work! You can also help us by visiting our supporters’ merchant sites, including AudiobooksUSA.com, your gateway to the top audiobook providers. ExpeditionDispatch is the newsletter of 1planet1ocean.
? Copyright 2009 1planet1ocean. All Rights Reserved. partnerships, offering solutions to the problems our oceans face. ecosystems, in order to inform strong conservation policies. provide a sustainable alternative that supports local communities.Connecting people to the oceans through outreach, education, videography, photography and leading-edge Web technologies.